I also wouldn't recommend going to a movie at the Fest unless you've seen that particular movie before. The sound is just a bit too iffy. But the atmosphere is nice. Seeing a movie under the stars with family and friends is quite pleasant. The festival is also a benefit for the NIH - a worthy cause. But why should Comcast donate a portion of their customer's payments to charity? Wouldn't it make more sense to just lower the rates - and let their customers decide for themselves, to whom and how much to donate? By Comcast making the decision to donate, customers not only lose the decision-making power but customers lose the credit as well. That's just wrong. Personally, I want to donate a portion of my income; but here Comcast is using my hard-earned money to send two messages: 1) they don't need the money and 2) they care. I don't believe either is true. Don't get me wrong - I believe the employees themselves care; but the company? It's a business answerable to shareholders. And like the customers, the shareholders themselves are perfectly capable of donating themselves. As for whether Comcast needs the money they are donating, that's a more difficult question. But the impression I get is that they might benefit by spending more money in hopes of improving their service. After all, Comcast continues to have one of the worst reputations in the industry. As if to drive the point home, my service went out recently. It began on a Thursday. The Comcast representative asked if I could be home on Sunday from 2-5pm. "Yes, but I'm pretty sure I need an outdoor technician, not an indoor tech. Can you please send someone who can climb the pole?" "No, we need to send an indoor tech first. If he determines an outdoor tech is needed, we'll schedule one at that time." I explained in detail why I felt it was likely outside but the rep insisted I be scheduled for an indoor tech and that I had to be home. Sunday 2-5pm - You can probably already guess - the technician didn't show. At 5:05pm, I called Comcast. The message I heard was (paraphrase) "We're sorry but the office is closed. Please call back during business hours." Turns out their business hours end at 5! Grrr. At that point, I called Comcast's national support number. (It's not advertised for local use but I use it as a backup for situations like this.) The rep who answered put me on hold while he checked why no one showed. Finally, I heard: "Dispatch cannot get a hold of him. He's probably running late; just wait another hour." I waited two more hours and then called again. "He was there - twice - and found no one home." The tech obviously never visited my house - I had my car in the driveway and garage doors wide open the entire time. The Comcast representative on the phone with me said "I don't believe him either." So he rescheduled me for two days later. He also recommended I call Monday and said that Comcast holds back a few appointments for emergencies or gets same-day appointments as people cancel. I called on Monday - no appointments. I asked if I could pick up a replacement modem just to confirm that it wasn't a modem issue. So on my way home from work, I stopped by the local office and swapped modems. I asked if the new modem has been tested. "Yes." Do I have to call you once I plug it in? "Sir, it will work. Just take it home and plug it in." Plugged in directly to where the line entered my house, the new modem didn't work, confirming to myself that it was an outside problem. On Tuesday, I waited during my 11-2pm time slot. At 1pm, I decided I'd better make sure the tech was coming and so I called Comcast. "We can't reach the technician but I'm sure he'll show." I explained that he didn't show the last time so I'd like some confirmation. I didn't get it. Tuesday 2:00pm - At the end of the time slot, I called Comcast. "We cannot reach the technician - just give him another hour and a half." Huh? The rep gave me her extension so I could call her back directly if necessary and then assured me she'll be on duty until 6pm. Tuesday 3:30pm - The tech still hadn't shown but I saw the modem go online. No connectivity however. I called up and asked 1) where the tech was and 2) if the modem was in the walled garden. It took her 10 minutes to confirm the walled garden. In other words, Comcast gave me a modem that their own service didn't recognize. Back from listening to Comcast's once-jazzy but now-disturbing hold music yet again, I heard her say "Let me put you on hold again while I fix it." After 20 minutes, I gave up waiting and hung up. Tuesday 5:00pm - The modem still wasn't working. The technician still hadn't shown. Three hours had passed since the time slot ended. Using the number given to me by the previous rep, I called her back. Got her voice mail. At this point, I called the regular local support line and spoke to yet another rep. He assured me he'd look into the problem and call me back. While we were speaking I suddenly saw connectivity. I must have been out of my mind at this point because I suggested canceling the appointment for the tech. I should have realized there was still a problem but I suppose I was thinking out loud why I should continue waiting for a tech who would never show. The rep cancelled the appointment. Turns out that he was a contractor so it was critically important that he not be told. According to him, he wouldn't get paid if he was informed the appointment was cancelled. I asked him why he was so late - almost 5 hours past the window! He said that Comcast overschedules him - all the time. I could see why. He spent about an hour checking the connections and signal levels inside and outside the house. Finally, he narrowed it down to an outside problem. Someone had added a splitter 5' up the pole. Not only was that the problem but it was amateurishly done. He said he'd phone it in and someone would come out within 24 hours and give me a direct connection. 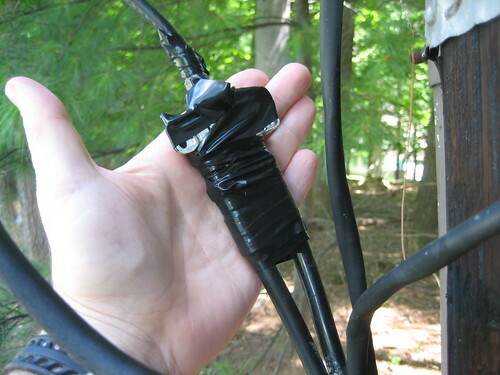 He put on new connectors and, using electrical tape, rewrapped the splitter little better than the way he found it and left. It's now been three weeks since my 6-day outage and the splitter is still hanging on the pole just the way he left it. I figure it won't be long before my connection goes out again. But if it does, I guess I can go watch movies for free at the Comcast Film Fest. The City of Rockville has agreed to adopt the Verizon cable franchise held by Montgomery County. This means that Rockville inhabitants will be able to get TV service as well as internet and phone service. Briana Gowing, Verizon VP of External Affairs said that Verizon hopes "to begin construction in mid to late September, possibly selling FiOS bundles in limited areas before the end of the year." Verizon's full press release covers more detail about the new service. I imagine that Verizon will push service into Rockville very quickly. Verizon says that roughly 23,000 households will be eligible. The downside is that residents in other parts of MC may have to wait even longer to get FIOS. Here is Verizon's list of roads where they're working during August 2008. Rockville residents will soon enjoy the same thing that I enjoy - namely, advertisements many times a month for Verizon service bundles. As a reminder, service bundles (TV, internet, and phone) sound attractive. However, I feel obliged to remind you that bundles have their downsides. Here's a discussion from dslreports as well as an earlier analysis that I made specifically about Comcast's bundles. To be fair, there are people for whom bundles make sense. I just don't think any of them would be reading my blog. It appears that the Rockville Council will put an agreement to bed with Verizon, allowing FiOS service to provided to residents of the City of Rockville. The Council is set to approve the agreement this Monday, June 9, 2008. If you're interested in attending, the meeting is at 7pm, although the Verizon items are slated for 8:35pm. Reading between the lines of the documentation that Rockville has made available, it appears that Rockville backed down on their demands for Verizon to pay Rockville's standard utility permit fees. It looks like Rockville has saved face by outsourcing much of their work, thereby cutting down on their own bills. At the same time, Verizon got a much better deal that it originally faced; however, it is taking a certain gamble that Rockville's new contractors are more efficient and won't leave Verizon with problems. We'll know in a year or so if this made sense. The documentation is quite vague about when service can be expected. Rockville residents might see service as early as this year. And some will receive service no earlier than next year. King Farm is specifically mentioned because it is served out of Verizon's Gaithersburg central office and Verizon does not even expect approval from Gaithersburg before next year.